In 1981, John Foxx escaped the grey concrete of Metamatic, choosing instead towade through overgrown European gardens, drift silently through the mist of fountains and gaze at colours reflected through stained-glass windows. Towards the end of 1980, a new single, "Miles Away", was released – although the song did not feature on either Metamatic or The Garden, the sound and style of the track, with it's huge synths and more live parts such as drums and guitar, bridged gave an indication of the shape of things to come, bridging the gap between Foxx's first two solo albums. The Garden is a complete contrast to Foxx's stark debut, Metamatic, offering a fuller, more organic sound. The return of Robin Simon on guitar heralded a distinctive style for this album, making it somewhat comparable to Systems of Romance – no coincidence, since The Garden features "Systems of Romance", a song originally written for the last Ultravox album, but never completed. 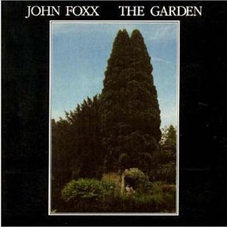 For The Garden, Foxx settled comfortably back into the sound and style that he had forged back in 1978. Foxx had become again obsessed with the overgrown jungles and abandoned cities of author JG Ballard's The Drowned World, and following a walking tour of England, and a time spent living in Italy, a more European flavour began to run through his music. By 1981, with new romanticism in full flow, John Foxx knew he wanted to produce a more natural and textured album – even taking it to the extreme of recording outdoors. In addition to guitar, more real bass and piano were played on The Garden, adding depth and warmth. Architecture, fountains, swimming, overgrown gardens and churches are recurrent themes in many of the lyrics on The Garden, although tracks such as “When I Was A Man and You Were A Woman” lyrically reflect the city setting of Metamatic. The album's opening track, “Europe After the Rain” takes its name from the Max Ernst painting of the same name; an image featuring a strange organic, overgrown landscape, which nicely ties-in with the Ballard influence. Foxx's childhood experience of singing in a church choir come into play on the vocorder-treated “Pater Noster”, and the synth-funk of “Blue Light” from Systems of Romance, is revisited for “Night Suit”, which also revisits the familiar “Quiet Men” territory. Vocally Foxx sounds liberated, with a sharper, warmer performance. A real passion is felt on tracks such as "Walk Away", "Europe After the Rain" and the haunting title track, which closes the album. Echoes of birdsong open “The Garden”, which stands out not only as the finest piece on the album, but also one of John Foxx's most emotive songs to date. “The Garden” fades out to birdsong, which is, in retrospect, a stylistic nod in the direction of Foxx's long-running Cathedral Oceans project, which he started around the same time – although the first Cathedral Oceans album would not see the light of day until 1997. The Garden was released in 1981, and followed the footsteps of Metamatic in the UK album and singles charts. 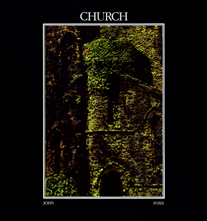 A number of original vinyl issues of the album came with an illustrated LP-sized book called The Church. It is very a different album to its predecessor – almost like a second debut, yet musically The Garden remains equally as unique, interesting and addictive. The 2008 remaster of The Garden comes with a mini reproduction of the Church booklet and a second disc containing a selection of tracks, many of which were previously unavailable. This includes early versions of some album tracks as well as the instrumentals “Fog” and “Swimmer 3” and “Swimmer 4” - these two pieces had previously appears on the 1983 Touch Meridians compilation album, entitled “The Quiet Man” 3 and 4 respectively. These tracks give a particularly interesting insight into the unreleased instrumental music Foxx was experimenting with at the time, some of which clearly influenced his Cathedral Oceans work. Click here for more information on single releases from The Garden.